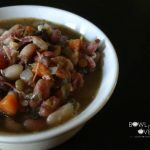 15 Bean Soup - Smoky, rich and deliciously flavored this soup has beans, hambone, carrots, celery, onions, cherry tomatoes, spinach and a TON of great flavor! Pick thru the beans well checking for small rocks and/or dirt clods. Rinse them in cold water and them soak them in water overnight. In the morning when you are ready to cook them, pour thru a colander and rinse them with cold water until the water runs clear. Set aside. Chop the carrots, onion, celery and spinach. Leave the tomatoes whole. Heating 2 tablespoons olive oil in a heavy bottom stock pot over medium heat. When the oil is hot, add the carrots, onion, celery, tomatoes and spinach. Add the pepper, red pepper flakes and Italian seasoning - do not add the salt yet! Sauté for 4-5 minutes until the vegetables begin to soften. Add the ham bone or ham hock, beans and 10-12 cups water. Increase the heat to high and bring it to a boil. Reduce to a medium low and cover leaving a small vent on the pot to allow some steam to escape. Stirring occasionally, cook until the beans are soft, about 1 1/2 hours. When the beans are soft, remove the hambone/ham hock and allow it to cool long enough to remove the meat. Add the meat back into the soup, plus the one cup diced ham. Mix well and simmer to warm thru. Now is the time to add the salt. Taste and adjust the seasonings. It may take about 1 teaspoon of salt. Why wait until the end to add the salt? Because if you add salt in the beginning, the beans will get tough and you'll end up adding lots more salt. Allow the flavors to develop and you'll be so pleased with the finished soup!